I am professor and former Chair of Business Dynamics, Innovation, and Economic Change at the Friedrich Schiller University Jena, Germany, and a research professor at the Halle Institute for Economics (IWH). I am also Associate Editor of the academic journals “Regional Studies” and “Small Business Economics”. Ich bin Professor für Volkswirtschaftslehre (Unternehmensentwicklung, Innovation und wirtschaftlichen Wandel) an der Friedrich-Schiller-Universität Jena sowie Forschungsprofessor am Institut für Wirtschaftsforschung Halle (IWH). Weiterhin bin ich Associate Editor der Fachzeitschriften „Regional Studies“ und „Small Business Economics“ tätig. February 22, 2018: Here is a picture together with Martin Obschonka, Dean Shepherd and Per Davidsson after our presentations at the workshop „What makes entrepreneurs successful and resilient?“ on February 15, 2019, at Queensland University of Technology in Brisbane, Australia. December 23, 2018: I am organizing together with Michael Wyrwich Special Sessions on „Historical Roots of Regional Performance“ at the ERSA Congress August 27-30, 2019, in Lyon. See the Call for Submissions here! The deadline for submitting an extended abstract is February 28, 2019. December 23, 2018: I am organizing together with Marcus Dejardin and Michael Wyrwich Special Sessions on „Regional Entrepreneurship Policy“ at the ERSA Congress August 27-30, 2019, in Lyon. See the Call for Submissions here! The deadline for submitting an extended abstract is February 28, 2019. Changoluisa, Javier and Michael Fritsch: New Business Formation and Incumbents’ Perception of Competitive Pressure. Review of Industrial Organization (forthcoming). Fritsch, Michael and Sandra Kublina: Persistence and Change of Regional New Business Formation in the National League Table. Journal of Evolutionary Economics (forthcoming). 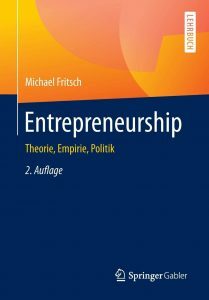 Fritsch, Michael: The Regional Emergence of Innovative Start-ups: A Research Agenda. In David Audretsch, Erik Lehmann, and Al Link (eds. ): A Research Agenda for Entrepreneurship and Innovation. Cheltenham, UK: Edward Elgar Publishers (forthcoming). Fritsch, Michael: Art. „Economic Restructuring.” In Raj Kollmorgen, Wolfgang Merkel and Hans-Jürgen Wagener (eds. ): Handbook of Political, Social, and Economic Transformation. Oxford: Oxford University Press (forthcoming).